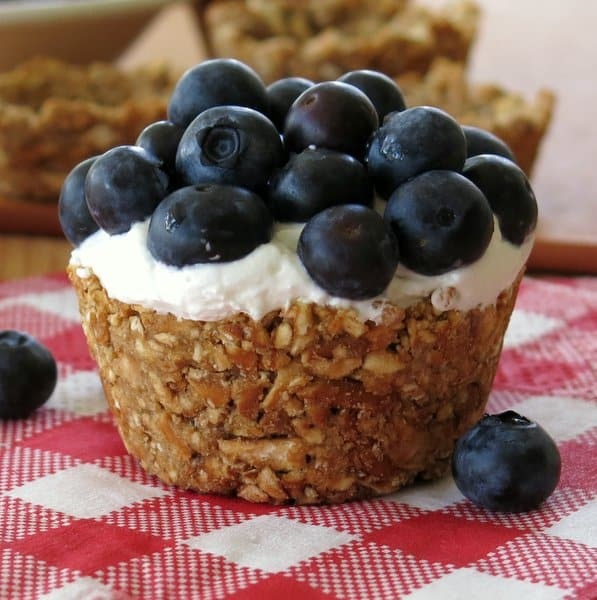 No-bake Mini Cheesecakes in a pretzel crust that’s shaped into a cup are easy and festive! 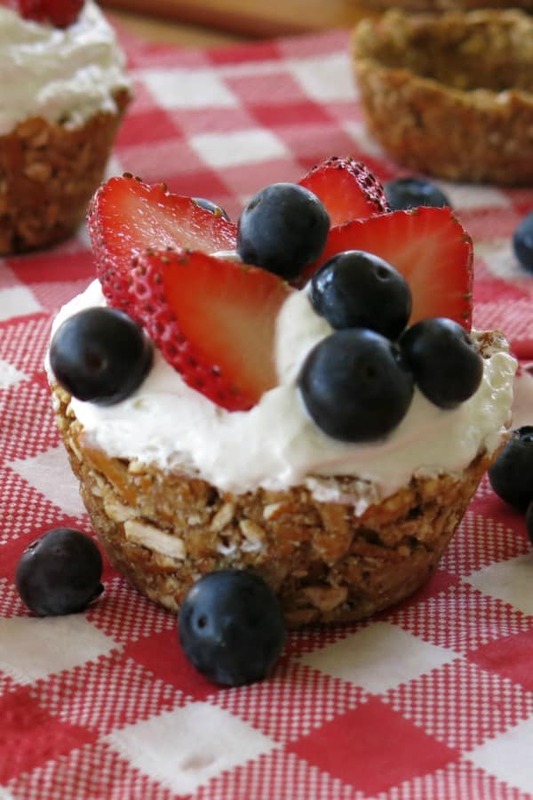 Dress them up with blueberries and strawberries for a patriotic, red, white and blue dessert! Or, come up with your own creation using the tips below. Need the convenience of a 3 ingredient recipe. There’s no need to plan ahead, just keep a few items on hand and the cheesecake “fix” can be satisfied very quickly. Don’t have time to make a real cheesecake. Real cheesecake is the best (in my humble opinion.) But, it takes time and talent to make a cheesecake that doesn’t crack or in some way turn out just the way it should. On the other hand, it’s very hard to mess up this recipe. Want to make dessert ahead of time. You can freeze this recipe! We did it all the time at our meal assembly kitchen. Want to control the ingredients. Depending upon the products used, this recipe can be low-cal, low-fat, vegan and sugar-free. We make no bake Key Lime Dip and Cheesecake Stuffed Strawberries for the very same reasons! The basic filling is perfect for trifles, full-sized cheesecakes or dip. Or, fill up a pretzel crust “cup” that has been healthified by swapping out butter for applesauce! 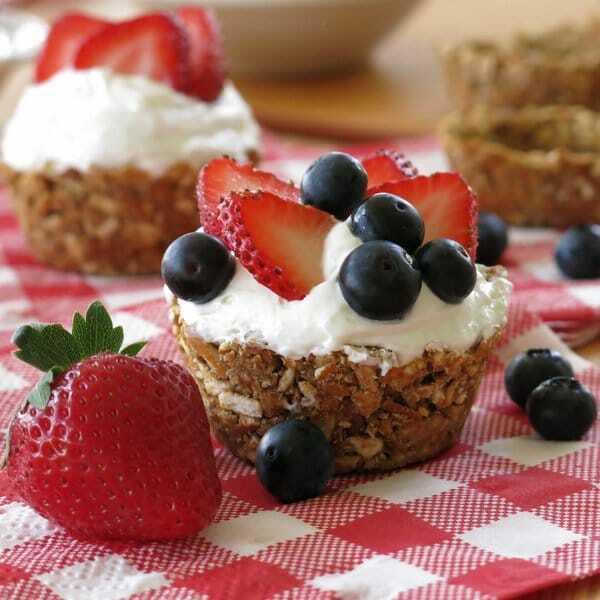 The no-bake filling is made by combining softened cream cheese, sugar and whipped topping, such as Cool Whip. Using a hand mixer, combine cream cheese and sugar until it’s light and fluffy Next, fold in the whipped topping. I usually give it a short whirl with the mixer again after this step just to be sure everything was well combined. The filling thickens as it rests in the refrigerator. We suggest waiting at least an hour. Or, it can be made several days ahead of time. Alternative: Fruit or other toppings can be folded into the filling at this point too! The nutritional information in the recipe card below is for full-fat ingredients. But, this basic recipe works for low-fat products, fat-free products and even vegan substitutes. For sugar substitutions, we recommend using a baking blend that substitutes one for one for sugar because of the bulk that is added. Other options may work but the yield will be much smaller. If you’re used to a certain type of product, such as low-fat, then you will love the result. If you want a closer variation of the real deal, then stick to full-fat products. We took a recipe for standard, buttery (and yes…very delicious) pretzel crust, such as this one by Southern Living and replaced the melted butter with apple sauce. It worked! It’s less sweet and a just a tad more chewy than the traditional version. But, it’s a very nice base for the creamy no-bake mini cheesecakes. To make the little cups, press about 2 Tablespoons of the mixture into a cupcake tin coated with cooking spray. Bake the cups and allow them to harden before adding the cheesecake filling. We added strawberries and blueberries for this recipe which makes the recipe perfect for Memorial Day, Fourth of July and Labor Day! The no-bake filling can be stored in the refrigerator after adding it to the cups. When you’re ready to serve, place the mini cheesecakes in the refrigerator for several hours to defrost. For best results, add fresh fruit toppings just before serving. 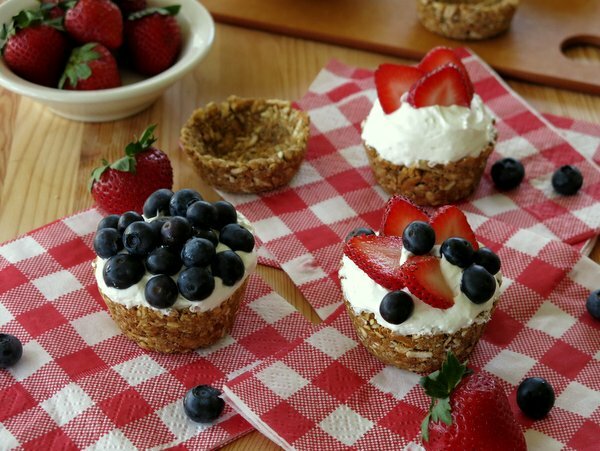 Dress up No-Bake Mini Cheesecakes in blueberries and strawberries to celebrate patriotic holidays.The pretzel crust shaped into cups swaps out butter for applesauce! Combine pretzels pieces and brown sugar in bowl. Add applesauce to the dry mixture and stir to thoroughly incorporate. Place about 2 Tablespoons of the mixture in the well of a muffin tin that has been coated with cooking spray. Press mixture firmly to the bottom and sides. Bake in oven for 10-12 minutes or until cups begin to firm up and are slightly browned. 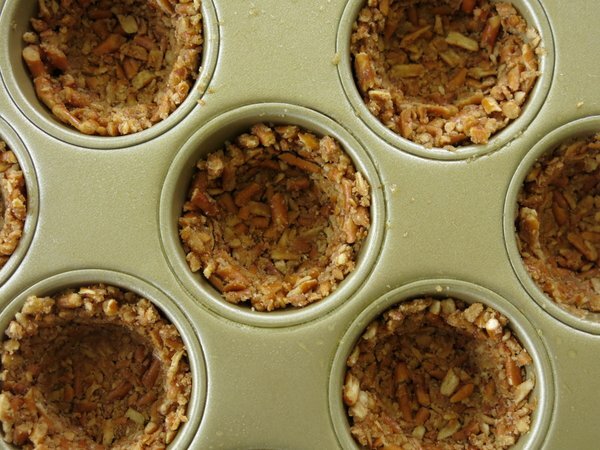 Allow pretzels cups to rest in the muffin tin for several minutes and then remove to a wire rack to cool. To make the filling, add cream cheese and sugar to a large bowl. Using a hand mixer, beat and combine the cream cheese and sugar until it is light and fluffy, about 3 minutes. Fold in whipped topping and stir to thoroughly incorporate. To assemble, spoon creamy mixture into cups and top with berries. Keep dessert cups refrigerated until ready to serve. Great twist w/ the pretzel crust! This looks amazing! Love the pretzel cups! So cute! This would make a great 4th of July dessert with red white and blue colors! Pretzel crust? I’m in! These look awesome! What an adorable idea! Perfect for picnics and dinner parties! I love the no bake directions for this recipes. Really sounds delicious. I adore no bake recipes, and this one is absolutely perfect. Love the pretzel crust, the cups are way too cute. These pretzel cupcakes are so cute!! What a neat idea! I love no-bake recipes 🙂 Thanks for sharing!! I am loving the pretzel cups! So cute! What a cute idea for cups! A perfect portion too! I love cheesecake, it is my favorite dessert. I am intrigued, I have never had it with a pretzel crust. Sweet + Salty is one of my favorite flavor combinations, so I’m totally loving these. And I love them even more for being low fat! I love anything no bake right now! This is such a great idea using pretzels! Sounds delightful! I love the sweet/salty flavor combo too. And the fact that there’s less guilt? That’s totally awesome. Love the blueberries and strawberries together! Yum! I love the combo of sweet and salty – great recipe for summer Marjory Pinned! 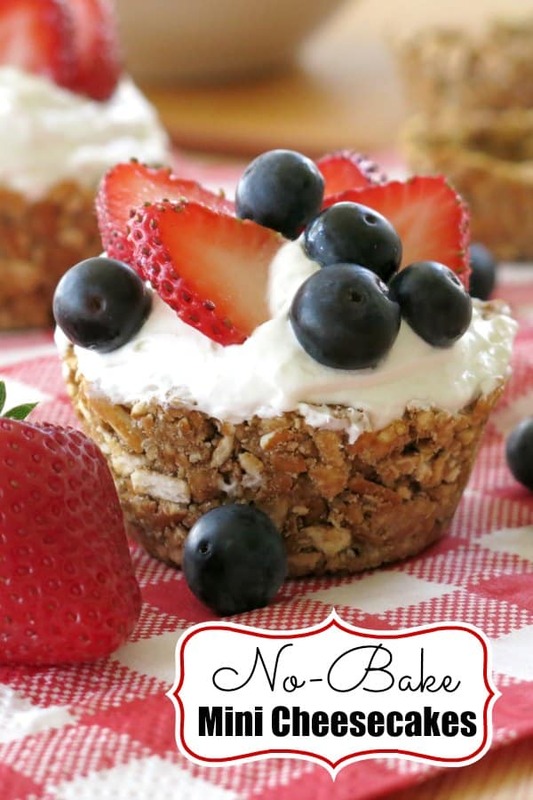 Anything No Bake has my name on it and this looks delicious- Yum! Thanks Marjory! I’ll be making these. Looks so delicious! These look amazing and anything that I don’t have to bake is a winner winner in my book!! Yummy! Thank you! I love a no-bake recipe too! I love how easy and yummy this recipe is. The salty sweet combo is the best! I didn’t have to try these to know I would love them, but WOW they seriously are amazing and my new favorites!